It’s easy to find new cheese sauce recipes from Foothill Farms® by simply entering “cheese” in the search box within the recipe link on our website. Searching for what’s new in the world of cheese sauce? It’s easy to find new cheese sauce recipes from Foothill Farms® by simply entering “cheese” in the search box within the recipe link on our website. Our chef at Kent Precision Foods Group (KPFG) is constantly whisking up delicious recipes and providing new concepts targeting foodservice professionals. He knows what is trending and focuses on helping you reach new heights in the food that comes out of your kitchen as well. (Read more about Chef Martin and his food philosophies.) Some of his recent cheese sauce recipes are Sriracha Jack Queso Sauce, Monterey Spaghetti, and Spicy Creamy Chicken Tortilla Soup. These recipes, as well as many others, were assessed in the test kitchen and will complement many foodservice kitchens. 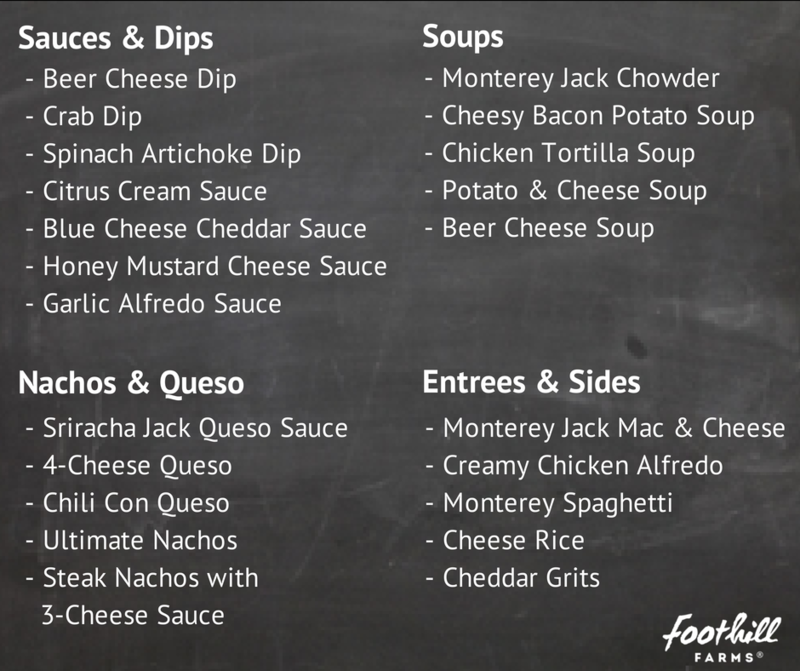 Dry mix cheese sauces add value and consistency to your menu by employing the speed scratch concept: make how much you need from a dry mix product with the addition of other fresh ingredients. Speed scratch products deliver the best combination of maintaining product predictability while still delivering your guests remarkable taste every time. Time and money…sauce mixes will save you both by allowing you to easily make only what you need. So if you’re looking for new cheese recipes that are crave-able and innovative, we’ve got you covered with our variety of cheese sauce recipes at Foothill Farms®. Remember, just search for “cheese” and our products and recipes will help you do the rest, easily and affordably.